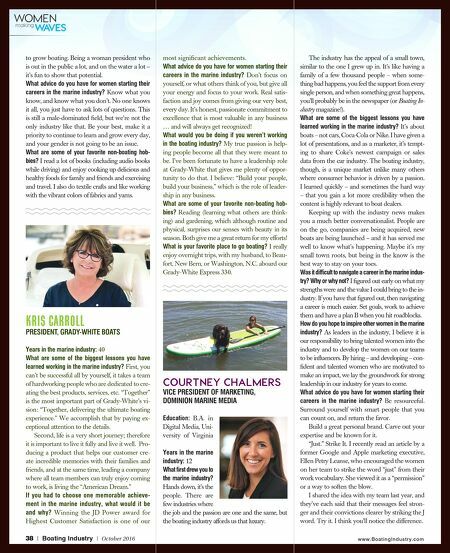 38 | Boating Industry | October 2016 www.BoatingIndustry.com WOMEN making WAVES to grow boating. Being a woman president who is out in the public a lot, and on the water a lot – it's fun to show that potential. What advice do you have for women starting their careers in the marine industry? Know what you know, and know what you don't. No one knows it all, you just have to ask lots of questions. This is still a male-dominated fi eld, but we're not the only industry like that. Be your best, make it a priority to continue to learn and grow every day, and your gender is not going to be an issue. What are some of your favorite non-boating hob- bies? I read a lot of books (including audio books while driving) and enjoy cooking up delicious and healthy foods for family and friends and exercising and travel. I also do textile crafts and like working with the vibrant colors of fabrics and yarns. KRIS CARROLL PRESIDENT, GRADY-WHITE BOATS Years in the marine industry: 40 What are some of the biggest lessons you have learned working in the marine industry? First, you can't be successful all by yourself, it takes a team of hardworking people who are dedicated to cre- ating the best products, services, etc. "Together" is the most important part of Grady-White's vi- sion: "Together, delivering the ultimate boating experience." We accomplish that by paying ex- ceptional attention to the details. Second, life is a very short journey; therefore it is important to live it fully and live it well. Pro- ducing a product that helps our customer cre- ate incredible memories with their families and friends, and at the same time, leading a company where all team members can truly enjoy coming to work, is living the "American Dream." 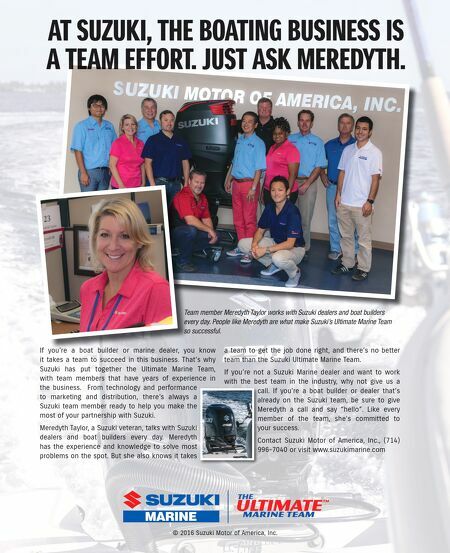 If you had to choose one memorable achieve- ment in the marine industry, what would it be and why? Winning the JD Power award for Highest Customer Satisfaction is one of our most signifi cant achievements. What advice do you have for women starting their careers in the marine industry? Don't focus on yourself, or what others think of you, but give all your energy and focus to your work. Real satis- faction and joy comes from giving our very best, every day. It's honest, passionate commitment to excellence that is most valuable in any business … and will always get recognized! What would you be doing if you weren't working in the boating industry? My true passion is help- ing people become all that they were meant to be. I've been fortunate to have a leadership role at Grady-White that gives me plenty of oppor- tunity to do that. I believe: "Build your people, build your business," which is the role of leader- ship in any business. What are some of your favorite non-boating hob- bies? Reading (learning what others are think- ing) and gardening, which although routine and physical, surprises our senses with beauty in its season. Both give me a great return for my efforts! What is your favorite place to go boating? I really enjoy overnight trips, with my husband, to Beau- fort, New Bern, or Washington, N.C. aboard our Grady-White Express 330. COURTNEY CHALMERS VICE PRESIDENT OF MARKETING, DOMINION MARINE MEDIA Education: B.A. in Digital Media, Uni- versity of Virginia Years in the marine industry: 12 What fi rst drew you to the marine industry? Hands down, it's the people. There are few industries where the job and the passion are one and the same, but the boating industry affords us that luxury. The industry has the appeal of a small town, similar to the one I grew up in. It's like having a family of a few thousand people – when some- thing bad happens, you feel the support from every single person, and when something great happens, you'll probably be in the newspaper (or Boating In- dustry magazine!). What are some of the biggest lessons you have learned working in the marine industry? It's about boats – not cars, Coca-Cola or Nike. I have given a lot of presentations, and as a marketer, it's tempt- ing to share Coke's newest campaign or sales data from the car industry. The boating industry, though, is a unique market unlike many others where consumer behavior is driven by a passion. I learned quickly – and sometimes the hard way – that you gain a lot more credibility when the content is highly relevant to boat dealers. Keeping up with the industry news makes you a much better conversationalist. People are on the go, companies are being acquired, new boats are being launched – and it has served me well to know what's happening. Maybe it's my small town roots, but being in the know is the best way to stay on your toes. Was it diffi cult to navigate a career in the marine indus- try? Why or why not? I fi gured out early on what my strengths were and the value I could bring to the in- dustry. If you have that fi gured out, then navigating a career is much easier. Set goals, work to achieve them and have a plan B when you hit roadblocks. How do you hope to inspire other women in the marine industry? As leaders in the industry, I believe it is our responsibility to bring talented women into the industry and to develop the women on our teams to be infl uencers. By hiring – and developing – con- fi dent and talented women who are motivated to make an impact, we lay the groundwork for strong leadership in our industry for years to come. What advice do you have for women starting their careers in the marine industry? Be resourceful. Surround yourself with smart people that you can count on, and return the favor. Build a great personal brand. Carve out your expertise and be known for it. "Just." Strike It. I recently read an article by a former Google and Apple marketing executive, Ellen Petry Leanse, who encouraged the women on her team to strike the word "just" from their work vocabulary. She viewed it as a "permission" or a way to soften the blow. I shared the idea with my team last year, and they've each said that their messages feel stron- ger and their convictions clearer by striking the J word. Try it. I think you'll notice the difference.